Jenny and I are really proud to announce that the second edition of our bestselling C# learning book, Head First C#, went to press! We worked really hard on it, and we’re very happy with how it came out. Are you looking for the easiest way to become a great C# programmer? If want to get productive fast with C#, .NET and Visual Studio 2010, then this is the book you’re looking for. We show you how to learn C# by building over 100 different projects—including lots of games!—and solving dozens of puzzles. Head First C# is a complete learning experience for programming with C#, the .NET Framework, and the Visual Studio IDE. Built for your brain, this book covers C# and .NET 4.0 and Visual Studio 2010, and teaches everything from inheritance to serialization. But don’t take our word for it! 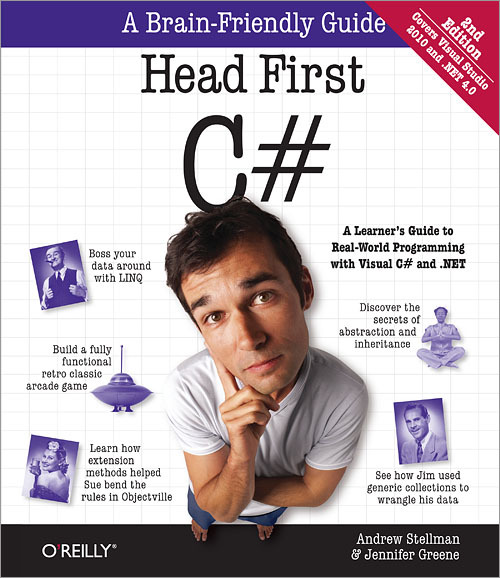 Download the free Head First C# eBook [PDF], which includes the first three chapters, complete. Or have a look at this typing game project [PDF] from chapter 4 to get a preview of the kinds of projects you’ll build throughout the book. So check out Head First C# today, and see what the buzz is all about! Available now from O’Reilly, and wherever fine books are sold.